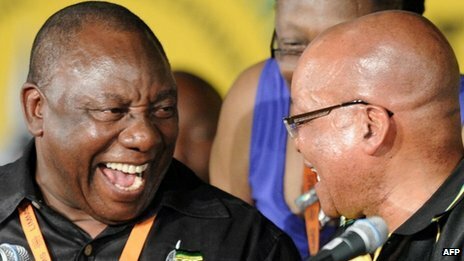 Lover of fast cars, vintage wine, trout fishing and game farming and the second richest black businessperson in South Africa (global financial publication Forbes puts his wealth at $675 million or £416 million), Cyril Ramaphosa (left) celebrates his election as deputy president of the ANC with South Africa's President Jacob Zuma. 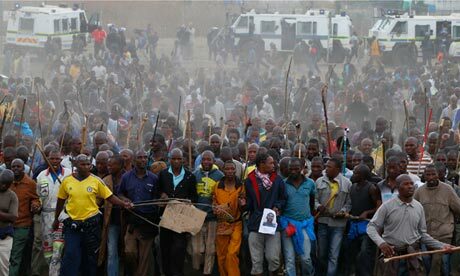 Ramaphosa demanded that police break the Marikana mineworkers' strike; police massacred 34 minerworkers and wounded 78 others. 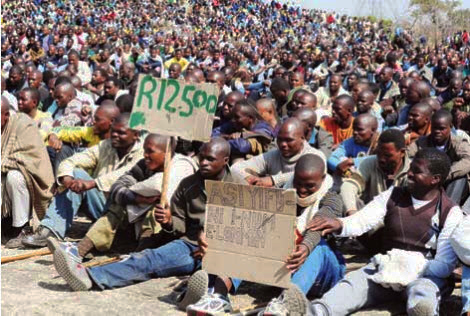 December 20, 2012 -- Links International Journal of Socialist Renewal -- As the official judicial investigating commission into the Marikana Massacre draws to a close in 2012, with many weeks of testimony in 2013 still ahead, what did the South African Police Service (SAPS) learn from their behaviour? For more on the Treatment Action Campaign, click HERE. December 10, 2012 -- TAC Electronic newsletter -- The Treatment Action Campaign (TAC) was launched on December 10, 1998, the 50th anniversary of the Universal Declaration of Human Rights. 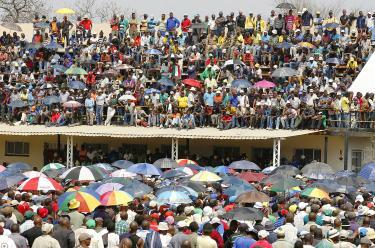 TAC turns 14 years old on international human rights day. This birthday comes at a time where many celebrate the good progress made with regards to expanded access to antiretrovirus medicines (ARVs), but its not yet uhuru [liberation]. This does not mean the war against HIV and AIDS is over as many of us tend to forget where we come from and much focus is still needed on the road ahead. Many global leaders have started to reverse their commitment to see this struggle through and get to the zero-infection, zero-deaths and zero-discrimination target. TAC campaigns for the realisation of the right to health including socioeconomic rights and the right to equality for poor people. Our main focus is the right to access quality health care that includes access to life-saving HIV treatment enshrined in the South Africa constitution. Between 1998 to 2012 TAC has created a profile as an organisation that fights for the realisation of the right to health for poor people living with HIV. Karl Cloete addresses NUMSA's February 2012 International Conference on Building a Socially Owned Renewable Energy Sector in Johannesburg. Click HERE for more discussion on radical workers' solutions to the environemntal crisis. Our starting point as NUMSA is that to effect an energy transition, we as the global union movement DO need a perspective to guide us as well as strategies to be utilised by the movement. While such a perspective and accompanying strategies will definitely not come fully formed and in one go, we HAVE to keep working on them through discussions, through struggles, through experimentation and through learning from experiences of those in the forefront of energy struggles (within and outside of the labour movement).